The School of Food has evolved to become one of the leading providers of chef training in Ireland. Their courses will give you the confidence and skill base to build a career as a chef or to establish your own food business. Since opening it’s doors, the School of Food has evolved to become one of the leading culinary colleges in Ireland. Brendan McDaid is one of Ireland’s leading PGA golf coaches, and a Teaching Professional Partner with Golf Digest Ireland. He is a former European Tour player himself, and also coached former professional Peter Lawrie to victory on the Tour. 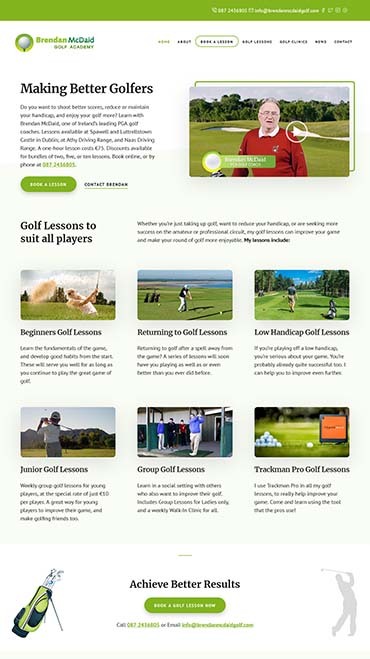 He now delivers golf lessons in Dublin and Kildare, and students of all levels enjoy great success. We built Brendan a website some years ago, but others then took over its maintenance, and it became ‘clunky’ and non user-friendly. It also lost its number one ranking in Google for the key search term ‘golf lessons Dublin’. Brendan returned to us to ask for a new-look site. He wanted to attract more people, and regain his number one spot. First, we carried out online market research, to determine the size of the potential marketplace. We also used our research to identify high-traffic terms that others were not targeting, such as ‘Beginners Golf Lessons’. We then drew up a page menu structure to optimise the chances of ranking highly for all these terms. Next, our senior copywriter spoke to Brendan in order to create content for all these pages. We decided on a conversational ‘first person’ tone, as though it was Brendan speaking directly to the website user, just as he would speak to a student during a lesson. We optimised all text for SEO purposes, sourced images and videos, and then moved on to the build itself. We knew that key to this design would be a crisp and clean look, to set it apart from competitor sites. Our designer opted for a green colour scheme to reflect golf courses. He also laid out all text in a size and format that’s easy to read. He used images wisely throughout the site, and improved video display too. Meanwhile, there are several strategic Call To Action buttons across the site, which although plentiful in nature, are never intrusive on the user. Overall, our designer achieved a site that is cleaner, slimmer, faster, more user friendly and more secure than before. We also added an SSL cert and GDPR compliance features in light of latest developments online. Finally, we got to work in earnest on SEO, to get the site to number 1 for all key terms. We will be continuing this work going forward, with one of our bespoke SEO packages. Kangen Water is a form of alkaline ionized water whose health and vitality properties have been recognised internationally for decades. Its popularity has grown immensely in recent years, aided by many celebrity endorsements. 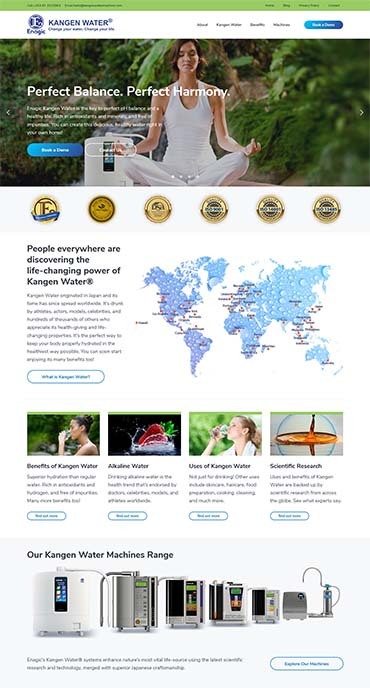 Consumers can produce Kangen Water at home with Kangen Water Machines – and we built a website for the largest network distributors of machines in Ireland and the UK. The fact that Kangen Water Machines have been around for so long was both a positive and negative for us here. On the plus side, there was a wealth of information about the machines, the benefits of the Kangen Water they produce, and research to back up those claims. On the other hand, there was also a huge number of other sites for independent distributors. This meant this was a very competitive marketplace. To convince people who may be dubious about the benefits of Kangen Water that it really is as good as it claims to be. To convince people who wanted a machine to buy from our client, rather than any other distributor. We therefore needed a really stand-out website design. We also needed content good enough to make people hit our ‘Book a Demo’ button, rather than going anywhere else. First, our senior copywriter got to work on creating that content. He took the best of all that material out there, condensed and re-wrote it for SEO purposes, and tailored it according to a menu structure which we carefully planned. Our senior designer then got to work. He followed client instructions regarding a clean and crisp lay-out, with plentiful ‘Call to Action’ buttons. He was mindful too of how many other distributors have templated sites. These sites are all identical apart from their contact details. He therefore strove for much better visual impact and functionality, to make our site stand out from the rest. He achieved this through sourcing and cleverly using high-impact images, and using a completely different colour scheme and lay-out. The result is a website design that almost screams health and vitality from every page. We then performed initial SEO work throughout the site, to get it ranked in Google. We will be continuing to perform SEO work going forward, through one of our bespoke SEO packages. 360 Fitness, based in Kilkenny, provides personal training and health coaching to people of all ages and all levels of fitness. Owner/operator Ciarán Clear prides himself on finding the right work programme and motivation for everybody. He wanted a website design Kilkenny that would properly portray his ethos and the training programmes he provides, and so he called us in. We eagerly got to work. We analysed the client’s existing website, and identified areas from improvement. This included both content and SEO considerations. We also surveyed the local area competition in terms of gyms and personal trainers, to properly identify a unique marketing message for his new web design. We formulated a plan and agreed it with the client. Our client had engaged his own copywriter for text content on this project. He supplied us with text that was comprehensive but not optimised for SEO purposes. Our own copywriter therefore edited it with this in mind. Once we agreed on the revised content, our designer got to work. In line with the client’s wishes, this website design has a very text-oriented home page, rather than the graphic-led style we usually produce. It works well in this application, as it immediately and effectively portrays the USPs of 360 Fitness. Our designer then introduced photos and graphics further down the home page, to make things more attractive. He did the same on internal pages, placing prominent and regular ‘call to action’ buttons throughout the regular text content. This produced a series of pages that actively speak to prospective clients, and that maximise the number of leads they generate. Technical improvements over the client’s previous website included a security upgrade, and a number of changes to deliver a quicker loading speed on both desktop and mobile versions of the website. Both are important SEO ranking factors as well as just general good practice. We also performed in-depth SEO at all levels, at both front end and back end of the site. 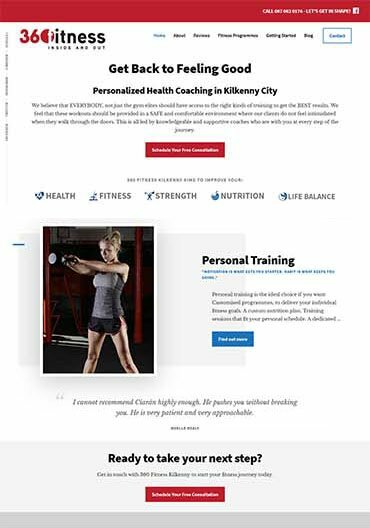 The result is a website that ranks number 1 for ‘Fitness Training Kilkenny’ and number 2 for ‘Personal Training Kilkenny’. It also features on Page 1 of Google for the more competitive term ‘gyms Kilkenny’. 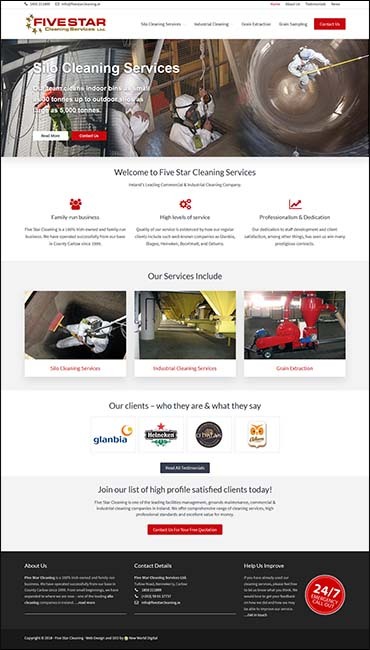 Five Star Cleaning in Carlow is a successful company which mainly serves the grain storage and processing sectors. They specialise in silo cleaning and maintenance, flour silo cleaning, but also offer a number of other services. These include industrial cleaning, factory cleaning, confined space cleaning, out of reach cleaning, pressure cleaning, food plant sanitation, and more. An existing website had become outdated in terms of both appearance and content. The company decided it was time for a fresh new look, and more up-to-date content. They called us in, and we eagerly got to work. The first step was meeting with the client to establish what exactly they wanted from their new website design Carlow. We also performed market research, to determine the extent of the Irish marketplace for such services, and formulate a plan for how the client could increase their share of it. Our senior copywriter then met with the client, to discuss content for the new-look site. He re-wrote some existing content to optimise for SEO, and crafted new content in other areas. This too was keyword optimised. The client supplied a number of good quality and high resolution pictures for the new site. We made our choice and edited them to suit. We now had all content in place, so we were good to go. 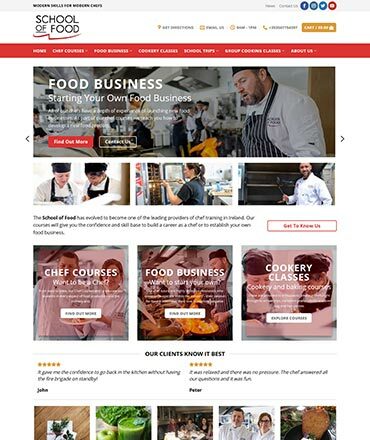 The actual website design and build was quite straightforward here, as the client had given us a clear vision of what they wanted. Our senior designer efficiently and expertly delivered this, with all his usual attention to detail. Key points of the design include a lean top-level menu, strategic call-to-action buttons, and prominent displays of prestigious client logos. These include such household names as Glanbia, Diageo, Odlums, and Heineken. We performed full SEO measures behind the scenes. Finally, we added fresh news items to the site, to bring it completely up to date. Our client was delighted with the result of our work. 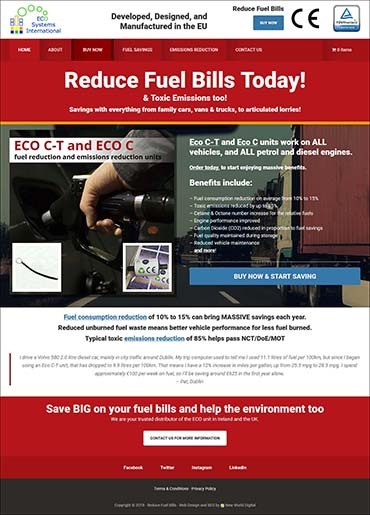 www.reducefuelbills.com is an e-commerce website to sell the innovative Eco C-T and Eco C units for petrol and diesel engines. Both are simple to use in any vehicle. They typically deliver fuel savings of up to 15%, and toxic emissions reductions of approximately 85%. Their benefits are therefore obvious. This project was at the request of an existing client, Jim Costello, for whom we had already delivered Complete Vehicle Solutions. Jim was happy with how that site was performing, so he knew he could count on us again. We didn’t let him down. This project was a little tricky from a content point of view, in that the benefits that the units deliver seem just too be good to be true. The internet is awash with other questionable products that promise significant fuel savings too, so our task was to convince people of the merits of these ones. Our copywriter/content creator therefore highlighted testing by a major German certification company. We also highlighted user reports from Europe of the savings others have enjoyed. In terms of emissions reductions, we highlighted actual NCT results. These showed how cars went from failing the test to passing it, after simply introducing one of these units. This part of our design process involved extensive consultation with the client. This was to ensure we made no false promises, and that the client could stand over everything the website said. Once content was okayed, we then moved on to the build itself. The website design itself saw our senior designer choose a bold and compelling style. It uses ‘straight to the point’ headlines and forceful bullet points, along with impressive graphics. Many other websites for such devices falter by being far too text-heavy and technical, but our ‘less is more’ approach is much more effective. Our designer also highlighted how the units have been officially tested and approved. He prominently displayed the ‘TUV Rheinland’ certification logo, alongside the logo for the CE certification the units have also obtained. This was to further instil confidence in prospective customers. We added e-commerce functionality through integration with the Stripe secure payment system, along with an SSL certificate. Finally, we began to perform SEO measures, to have the site rank highly in this competitive marketplace. 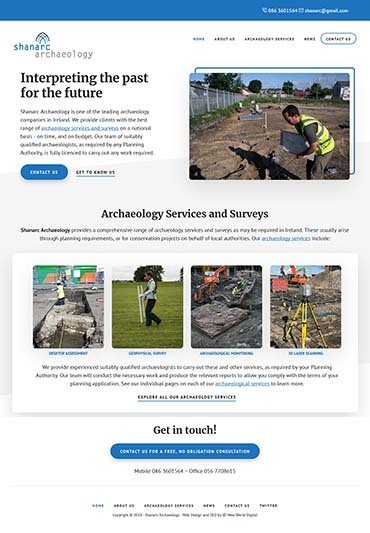 Our latest website design Kilkenny project is for Shanarc Archaeology, based in Kilkenny, Shararc are one of Ireland’s leading providers of archaeological services for both construction and heritage purposes. They had an existing website, which was quite basic. It did not properly portray either the full scope of the services they provide, nor their expertise in each of those areas. They came to us to ask for a new and improved site. We were glad to oblige. As always, we first audited their existing site, and studied websites of competitor archaeological companies too. We also performed keyword market research to establish the key search terms in the field. There was a number of interesting findings, including that in general, neither the existing website nor competitor sites had any great level of detail on these terms. We therefore determined that these key search terms would be the foundation of the new site. We then formulated a plan for website hierarchical structure and content, and okayed this with the client. Our senior copywriter then got to work, using guidance from the client and additional research to create SEO optimised text content. Once we also okayed this with the client, our designer got to work. 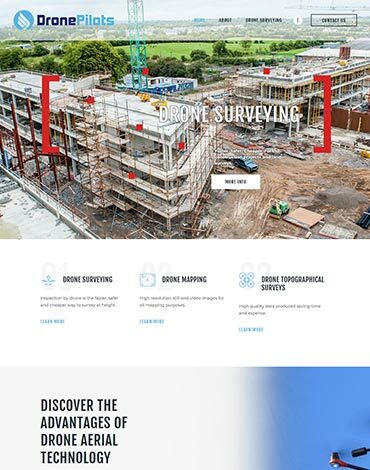 Our senior designer decided on a more ‘clean’ and ‘lean’ website design than used by most other archaeological companies. This is because many of other sites are particularly dense with text, which can be off-putting for the user. We were conscious that many people seeking archaeological services require them for reasons to do with construction projects, rather than historical research. We therefore wanted the site to be as accessible as possible to all, and not just to academics. 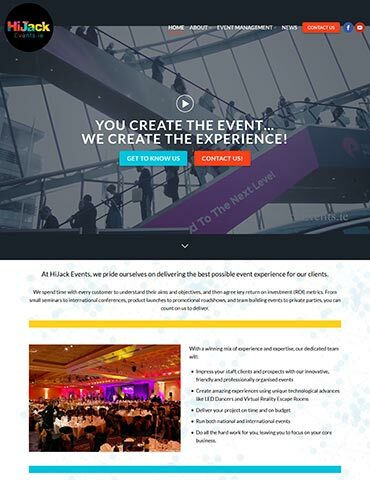 Our design has a services menu and contact form in easy reach at all times, to maximise user engagement. We also gave the new site our customary SEO attention at the back end, and we submitted for Google indexing. The new site immediately ranked on Page 1 for several key terms – and was soon moving up Page 1 too. Another successful outcome!